Cats often begin to experience dental disease from middle age. While cavities may not be as common in cats as they are humans, oral health is equally important. Poor nutrition and a lack of oral health can not only result in decayed teeth, but also halitosis and gum disease. Left untreated, the decayed teeth of your pain-stricken feline can abscess. Feline odontoclasic resorptive lesions do not discriminate by age, affecting felines from the youngest of kittens to the oldest of elderly cats. According to FabCats.org, an estimated 72 percent of cats over the age of 5 have a minimum of one FORL. The odontoclast is a type of feline cell that causes the disintegration of tooth structures as the cells attach to normal cavities. Odontoclast cells are used to reabsorb deciduous (milk teeth), but as the resorption process takes place, complications can occur. As your cat moves through the various stages of tooth decay, he may experience a number of uncomfortable and downright painful symptoms. The stage of absorption is generally determined using a probe under general anesthesia. While stage 1 only indicates a minor condition, stage 2 jumps to a moderate decay. 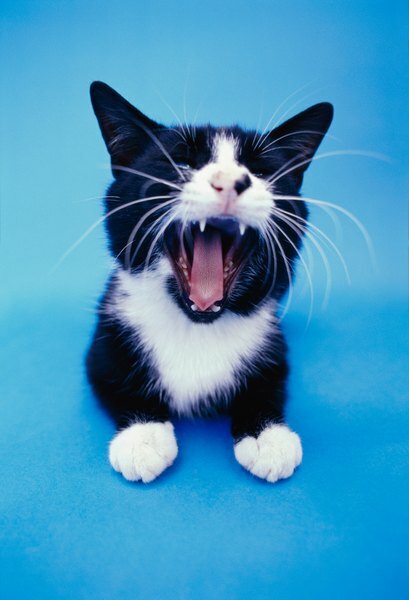 When your cat reaches stage 3, major tissue loss is present, often exposing the tooth root. Once stage 4 is reached, both the root and the crown of the tooth is decayed. Stage 5 is most severe as only minimal hard tooth tissue remains and any leftover decayed teeth are covered by the gums. As your cat goes through these stages, he may experience drooling, bleeding from the mouth, or difficulty chewing. Jaw chattering while eating is also common. While there is no single cause of teeth decay in cats, certain factors such as mineral imbalances and dental issues like plaque, are thought to contribute to decay. To determine the severity of your cat's teeth decay, your vet will most likely use radiography. Diagnosis tools, such as probing, should only be done under general anesthesia, as the pain from FORLs can be too much for your sensitive feline. In some cases, an underlying disease of the mouth may be the cause for your cat's decayed teeth, such as lymphocytic plasmacytic stomatitis syndrome. Your vet may take X-rays as part of the diagnosis process and any teeth with FORLs will need to be removed. It's important not to let FORLs develop, as root retention can occur from erosion. To prevent a bacterial infection, immediate treatment is needed for decayed feline teeth. If your cat is only at stage 1, surgery may be recommended. Once kitty has reached stage 2, crown reductions or the removal of the decayed teeth may be necessary. Unlike with humans, fillings for decaying teeth are unsuccessful, as the cavities produced by FORLs are not due to decay. Stage 3 of feline teeth decay almost always requires surgery. At stage 4 and 5, treatment of the affected areas, as well as extractions, are typically recommended. According to the ASPCA, pet parents should check for swelling, strange odors, and the common symptoms of tooth decay frequently. To help prevent further damage to kitty's teeth, add water to soften your cat's food and brush those pearly whites daily. What Ingredients in Dog Toothpaste Are Best for Cleaning Tartar?